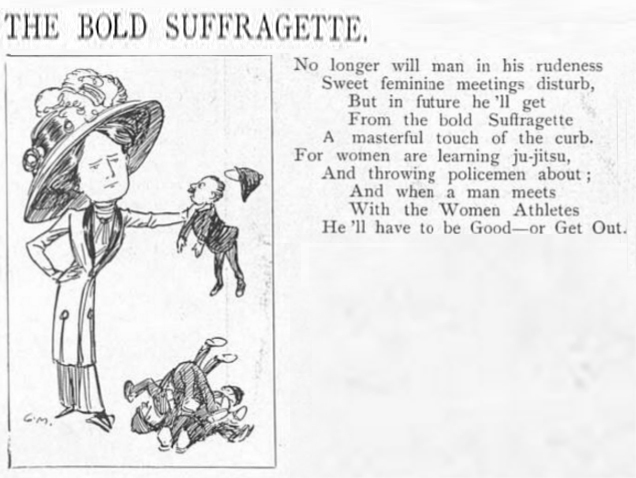 This caricature of suffragette jujitsu trainer Edith Garrud, and accompanying poem titled “The Bold Suffragette”, first appeared in the Wednesday, 13 July 1910 edition of The Sketch. The following article was first published in Votes for Women, the newspaper of the Women’s Social and Political Union, during March of 1910. At that time, Edith Garrud (right, above) had been running her “Suffragettes Self Defence Club”, which was advertised in Votes for Women, since at least December of the previous year. The club was based at Leighton Lodge in Edwardes Square, Kensington, a facility which also included a number of studios for classes in sculpture, painting and voice. The Suffragette self defence classes started at 7.00 p.m. each Tuesday and Thursday evening and cost 5s, 6d per month. By 1913 – in response to the Cat and Mouse Act, which allowed hunger-striking suffragette prisoners to be released and then re-arrested once they had recovered their health – Mrs. Garrud was training the secret Bodyguard Society, A.K.A. the Amazons, in preparation for street-fighting with the police. 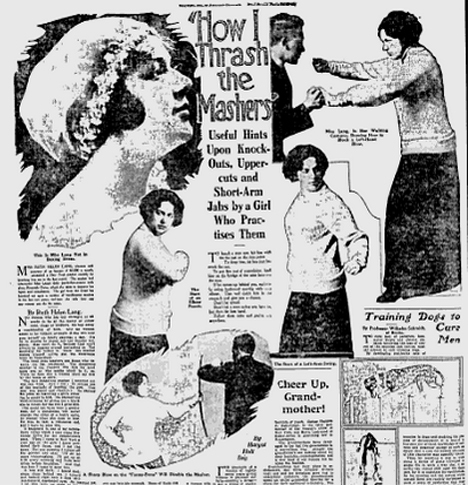 A selection of classic jiujitsu “tricks” as women’s self-defence in this photo-feature from the Chicago Tribune of June 20, 1915. Miss Ruth Helen Lang, nineteen and possessor of an income of $1000 a month, astonished a New York masher recently by knocking him out in the first round. The masher had interrupted Miss Lang’s daily just-before-sunrise walk along Riverside drive, which she takes to improve her figure and complexion. The girl from the Coast has knocked out quite a number of troublesome mashers in the last two years, and here she tells how any woman can do the same. No woman who has any strength at all needs to be at the mercy of either cads, thugs or mashers, the last being a combination of both. And no woman needs to be without strength if she will only give herself an hour’s exercise a day. It’s up to women to stamp out the masher “nuisance”. Men can’t do it, because they can’t always be tagging around protecting us. The necessity for action is when the masher makes himself active and the resistance must be immediate. The dangerous mashers are those who deserve the fist treatment. The dangerous masher is the creature who lay his hand upon you or who seems about to do so. When he does this a woman must lay him by the heels at once. The last dangerous masher I knocked out was last week. How I did it illustrates one of the methods of meeting the pest. This man was proud and vindictive. He showed his pride by resenting a girl’s refusal to speak to him. He showed his vindictiveness by giving me a black eye in return for the two I gave him. He could not have been a gentleman, for a gentleman will never change the color of a lady’s optic, no matter what she does to him. He was in fact, a villainous cad, and I hope he sees this. It happened in one of my beforehand walks which I take along the Riverside Drive for my complexion’s sake. When I came to New York a year ago all the girls I knew powdered their faces and I did the same. But one morning I rubbed off the powder and said: “I’ll do no more whitewashing. I’ll get up at 5:30 every morning and walk four miles before breakfast.” And that was how I came to meet him. It was still dark. I heard footsteps close behind me. I turned and looked right into a face with red-trimmed, dissipated eyes. He insulted me. I let him walk close to me. He was watching my right hand. As he came close I swung at him. I caught him on the bridge of the nose. He nearly fell but recovered, came at me and landed on my eye. Then I gave him a blow behind the ear that sent him sprawling. Then he ran. Now observe that I hit him first between the eyes when he didn’t expect it. When I hit him the second time it was to fell him. I made a mistake. I should have followed my rule and knocked him out first, but I didn’t think he was so dangerous. I would advise every woman to get a punching bag and to practice the swift upward swing of the fist known as the uppercut. The quicker and the harder she can make the hit, the better the chance she has of discouraging the masher. The uppercut is good for close quarters. If the man is at one side, bring him up the arm with a swift circling swing and land on the ear. If the masher comes up behind you and catches your arm bring your elbow back as hard as you can against his stomach. Ten to one, he will release you under the pain. Then turn quickly and give him the knockout on the point of the chin. If by any chance the masher has gotten in front of you and is holding both your hands, bring your knee up with all the force you can into his stomach. None of them can stand that. Usually I carry a heavy cane. That is an excellent weapon under certain conditions. I always try to hit the masher upon the elbow. The pain gives him all he wants to think about for a few moments and while he is wrestling with that he is in your hands to knock out as you please. It is a fact that few of these creatures have as much strength as a woman, decidedly not as much as a well-cared-for woman. They are usually weakened by dissipation or are puny. Where a woman makes her great mistake is in becoming frightened. She does not know what I have just been saying, or she does not remember it. Instead, the fear she had inherited from thousands of cave women who had to be continually watching out for too impetuous and club-wielding males overcomes her even now. She faints, she becomes weak, she does not use her wits nor her strength. And that is just what the dangerous masher counts on. Remember, sisters, don’t lose your nerve. Hit and hit hard. He won’t wait for a second blow in nine cases out of ten. Get a punching bag and cultivate your muscle. Get out and walk and cultivate your health. Cultivate your nerve and your punch, and soon the race of mashers will be but a bruised and battered memory. To knock a man out, hit him with the fist just outside the chin point. To drop him, hit him just beneath the ear. To put him out of commission, land him on the bridge of the nose between the eyes. If he comes up behind you, suddenly swing backward quickly with your elbow. This will catch him in the stomach and give you a chance. Don’t hit a man unless you have to, but hit him hard. Follow these rules and you’re safe anywhere. The arrest of a suffragette Amazon? Does this rare photograph taken at a suffragette rally show the arrest of one of Mrs. Pankhurst’s bodyguards? It appears that the police constable is holding a pair of wooden Indian clubs in his right hand as he moves towards the woman who is turned away from the camera. 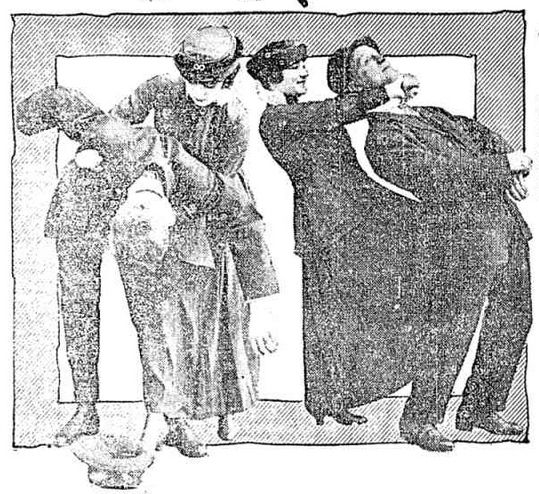 Alternatively, the woman may be holding the clubs in her left hand as the constable twists her left arm behind her back, with his right hand covering her left hand. Indian clubs were designed and sold as exercise tools but they became the signature weapons of the Amazon guards, who sometimes carried them concealed underneath their dresses. A large number of Indian clubs were confiscated from suffragette bodyguards after the infamous “Battle of Glasgow” brawl in 1914. 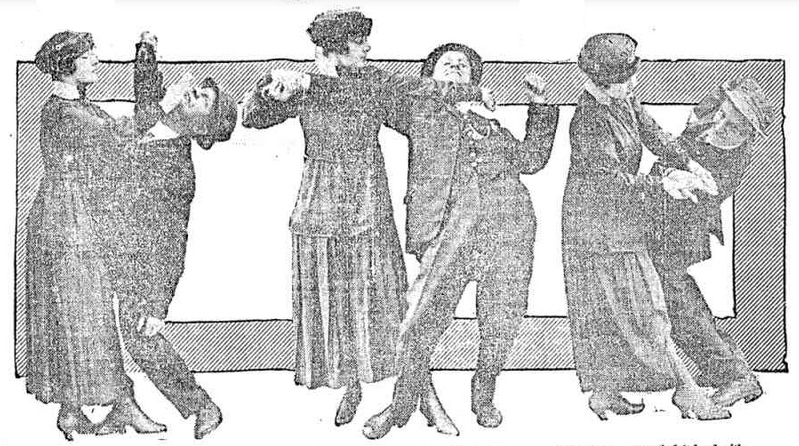 When Edith Garrud began offering jujitsu classes to women’s rights activists, the press response was frequently one of bemusement, as seen in this Daily Mail cartoon from April of 1909. As the radical suffrage movement became ever more militant, however, people soon stopped laughing at the notion of “jujitsuffragettes”. Many colourful stories are told of the adventures of the Amazon Bodyguards, including a number compiled in an unpublished manuscript by former Bodyguard Katherine “Kitty” Marshall, which was titled Suffragette Escapes and Adventures. After one window-smashing protest, jujitsu instructor Edith Garrud reminisced, she led a group of suffragettes fleeing the police through the back-alleys of London to her dojo (martial arts school), where the fugitives hid their weapons in trapdoors hidden under the mats. By the time the “bobbies” came knocking at the door, they found only a group of young women innocently practicing jujitsu. I have reached London tonight in spite of armies of police. I am here tonight, and not a man is going to protect me, because this is a woman’s fight, and we are going to protect ourselves! I am coming out amongst you in a few minutes and I challenge the government to re-arrest me! The Bodyguard continued to batter the police as they made their way towards the nearby Ladbroke Grove station, at which point, bruised and exhausted, they discovered that the veiled women they had captured was a decoy; the real Mrs. Pankhurst was long gone, having simply waited out the excitement in the balconied house at Camden Square before being spirited away by the Bodyguard and a “smart woman driver”. Whatever happens will hit the Government. If I get away they will again be laughed at, and if I am taken the people will be roused. The fools hurt themselves every time. The Bodyguard had travelled up from London by train, spending an uncomfortable night in a third-class carriage before booking into a local hotel under the guise of a theatrical troupe. On the evening of March 9th, St Andrew’s Hall was packed to capacity with a crowd largely sympathetic to the Suffragettes’ cause. The Bodyguard carefully surveyed the crowd from their vantage point, a semi-circle of chairs set up on the stage directly behind the speaker’s podium. Garlands of white and purple flowers decorated the edge of the stage and banners bearing the Suffragette mottoes, “Deeds Not Words” and “Votes for Women” were strung high above them. The Glasgow police had taken no chances, surrounding the entire hall with a cordon and also stationing 50 constables in the basement. The atmosphere was tense, even more so when the appointed hour of 8.00 came and went with no sign of Mrs. Pankhurst. Many members of the audience doubted that she could possibly break through the cordon, no matter how many Bodyguards she might have to help her. Thus, when she suddenly appeared on the stage, the effect was like magic; though, as with the most apparently sophisticated illusions, the principle was simple misdirection. After spreading a rumour that she would attempt to breach the cordon, she had in fact arrived at the hall early and in disguise, paid for her ticket like any other member of the public, and taken a seat close to the platform. I have kept my promise and in spite of his Majesty’s Government I am here tonight. Very few people in this audience, very few people in this country, know how much of the nation’s money is being spent to silence women. But the wit and ingenuity of women is overcoming the power and money of the Government! My text is – equal justice for men and women, equal political justice, equal legal justice, equal industrial justice and equal social justice! That was as far as she got before being interrupted by the heavy tread of police boots, as the squadron in the basement made their way upstairs to the hall. Just as the helmeted head of the lead constable, a giant of a man, appeared in the doorway, Janie Allen, a Scottish Bodyguard who was wearing an elegant black evening gown, stood up from her seat, drew a pistol and fired it straight at his chest. There was a deafening blast and the constable fell back into his colleagues, believing that he had been shot – but in fact, the pistol was loaded with blanks. As the startled and angry police struggled to climb past the panicked giant in the doorway, the Bodyguard pulled out their Indian clubs and took up a defensive formation around Mrs. Pankhurst, who continued to speak over the commotion. The police finally broke through onto the stage and a fearsome fight took place; 25 women armed with Indian clubs and jujitsu vs. 50 truncheon-wielding police constables. The audience began to jeer and boo at the police, drowning out the speech they had come to hear. Pandemonium now reigned in the hall. Several plain-clothes detectives, who had been hiding in the crowd, attempted to blindside the Bodyguard by climbing onto the platform, but were repelled by a barrier of barbed wire that had been hidden in the floral garlands decorating the edge of the stage. Old ladies then stood up and belaboured the detectives with their umbrellas. Chairs and tables were overturned as the combatants on the stage swung and jabbed, grappled and fell. Gert Harding, the Canadian woman who was the tactical leader of the Bodyguard, was not allowed to risk arrest by being caught with a weapon and was therefore unarmed when a constable raised his truncheon at her. She later recalled being surprised when he seemed to change his mind at the last instant and, instead, threw her into a pile of toppled chairs. 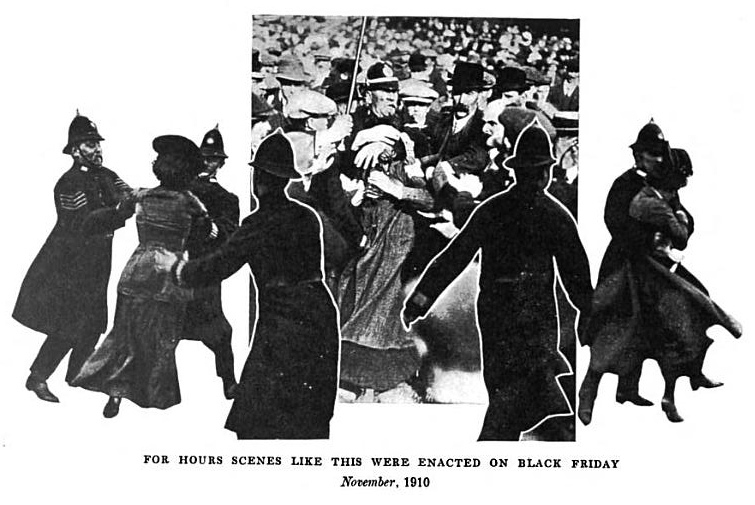 Eventually, the constables overwhelmed the Bodyguard resistance and hauled Mrs. Pankhurst off to a waiting police cab, her clothes torn to shreds during the struggle. The audience was outraged, particularly when the detectives attempted to break up the meeting, and angrily shouted them down; the meeting was, in fact, legal and they carried on with it, hearing speeches by other Suffragette leaders. 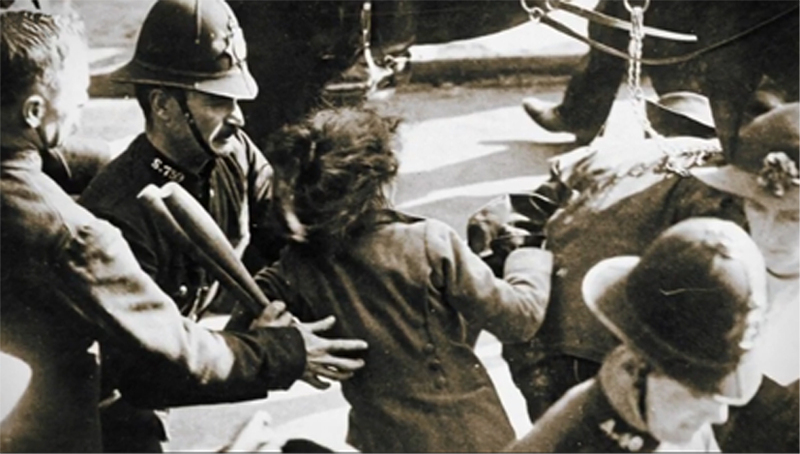 Afterwards the crowd marched to the Central Police Station in St. Andrew’s Square, forming a mob of protestors that was estimated to include some 4,000 people, chanting their support for Mrs. Pankhurst until they were dispersed by police on foot and horseback. I have tried to destroy the picture of the most beautiful woman in mythological history as a protest against the Government for destroying Mrs. Pankhurst, who is the most beautiful character in modern history. Thereafter, the Suffragettes’ protests by arson and vandalism became more frequent and much more destructive, provoking a backlash both from within the WSPU and from the general public as well. The Bodyguard continued their duties, however, including an infamous street fight with the police outside Buckingham Palace on May 21 that left one constable knocked unconscious and many people injured. “We have not yet made ourselves a match for the police, and we have got to do it. The police know jiu-jitsu. I advise you to learn jiu-jitsu. Women should practice it as well as men. – Suffragette leader Sylvia Pankhurst, quoted in the New York Times on August 12th, 1913. By 1913, the sociopolitical battle that was the British women’s suffrage movement had reached a boiling point. Women had been petitioning for the right to vote for over four decades before suffrage leader Emmeline Pankhurst decided to take radical action against the government, crossing the line from peaceful protest into guerilla tactics of civil disobedience, sabotage and mass vandalism. Faced with the practice of hunger striking by jailed Suffragette leaders, the government responded with the so-called “Cat and Mouse Act“; an unprecedented amendment to the law that allowed prisons to deal with starving prisoners without resorting to the highly controversial methods of forced feeding. Under the new Act, a starving suffragette could be released from jail “on licence”, allowed time on the outside to recover her health, and then be re-arrested on the original charge. To keep their leaders free as long as possible, as well as to protect them against run of the mill assaults by irate defenders of the status quo, the Women’s Social and Political Union created a secret society known as The Bodyguard. Numbering 25 or 30 athletic and dedicated women, the Bodyguard was charged with providing security at Suffragette rallies throughout the UK. The members of the Bodyguard started training in the Japanese martial art of jujitsu, which had been introduced to London some 15 years previously by Edward William Barton-Wright, the founder of the eccentric and eclectic self defence art of Bartitsu. They were trained in a succession of secret locations by Edith Garrud, who was among the very first professional jujitsu instructors in the Western world. They also carried wooden Indian clubs concealed in the bustles of their dresses, to defend against the truncheons of the police. Journalists, delighted by this colourful wrinkle in an already juicy story, quickly came up with nicknames for the Bodyguard, referring to them as the “Amazons” and the “jujitsuffragettes”. Click here to read about some of their escapades. 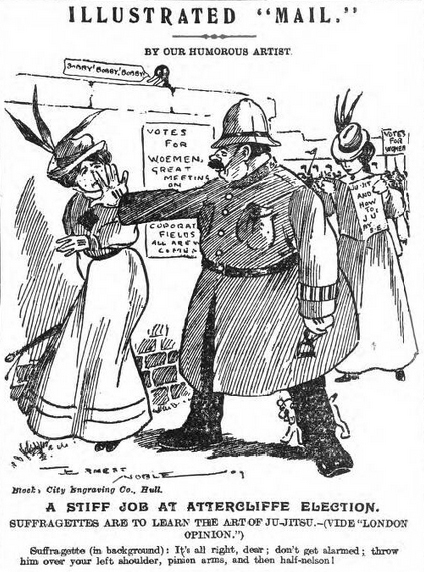 Along with their practical duties, the Bodyguard also became something of a symbolic rallying point as the Suffrage movement became ever more radical. They served an important role as agents of propaganda, ensuring that women’s suffrage stories stayed in the newspaper headlines; a necessary and valuable tactic towards winning over hearts and minds. The outbreak of the First World War, though, put an end to the Bodyguard and to most radical Suffragette activity, as Mrs. Pankhurst decided that “votes for women” would be meaningless if England was conquered by Germany. Instead, she urged her supporters to throw their strengths and skills into supporting the government for the duration of the crisis, including many activities that were formerly considered to be strictly “men’s work”. In March of 1918, the Representation of the People Act was passed, granting voting rights to some eight million English women. A collection of Suffragette bodyguard weapons and tools confiscated by police following the infamous “Battle of Glasgow” brawl, which took place at St. Andrew’s Hall on the evening of March 9th, 1914. This picture was originally published in the Daily Record and now forms part of a display at the Glasgow People’s Palace museum. * bottom row, third from left: a section of barbed wire, probably part of the barricade that was concealed around the edge of the St. Andrew’s Hall stage; a pistol, probably that which was loaded with blanks and fired to intimidate the police by Scottish suffragette Janie Allen. It has come at last! The word for which the world has long waited, the word that will immortalise the militants, has made its appearance in the dictionary of dynamic didoes that form such a conspicuous part of the “votes for women” propaganda. It is “suffrajitsu” and the correct way in which to pronounce it is “suffrajitsoo”. The equal-suffrage crusaders may not be the authors of this picturesque word, but no-one who has seen them in action would doubt that they are the originators of the particular tactics that called it into being and general use in the land where they operate with most persistence. It was the Japanese who became the most formidable man-handlers in the world by their manipulation of the pneumogastric nerve and other anatomical tricks; and their system is called jiu-jitsu. But from all accounts, jiu-jitsu is no more effective for the purposes for which it may be used than “suffrajitsu” is for withstanding the rude attacks of guardians of the public peace. All regularly accredited members of the English militant organisation are required to take a regular course in “suffrajitsu”.